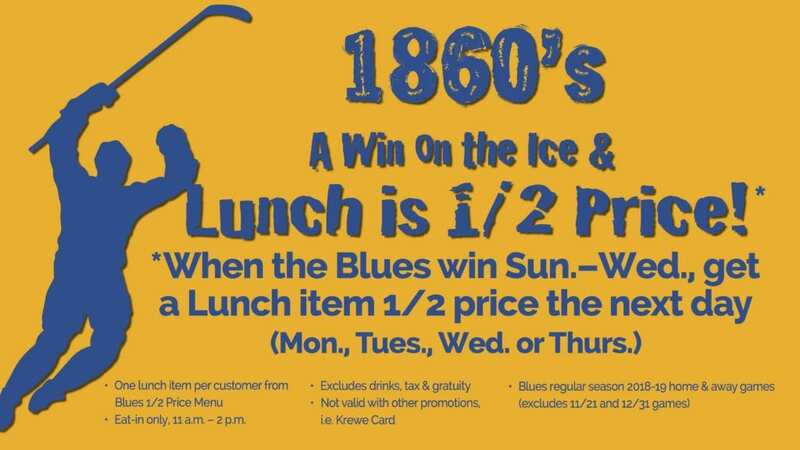 1860 Saloon, Game Room & Hardshell Cafe in Historic Soulard is celebrating Blues hockey with a “Win on the Ice & Lunch is 1/2 Price!” promotion. This Blues Hockey 2018-19 season, when the team wins on a Sunday, Monday, Tuesday or Wednesday during the regular season, customers can come in the next day choose an item from a special 1/2 price lunch menu! The special is from 11 a.m. – 2 p.m. the day after the win. It is not combined with other promotions and excludes the 11/21 and 12/31 games. The wide variety of items on the 1/2 price lunch menu include popular salads, sandwiches, burgers, pizza and cajun fare. It’s dine in only and does not include drinks, tax or gratuity. Going to a game this season? Meet at 1860s and ride the complimentary shuttle to the home Blues games. Enjoy a drink and bite to eat before or after the game. The kitchen is open until 10 p.m. every day but Friday and Saturday, when it closes at 11 p.m. There is plenty of free parking across the street and in the Soulard neighborhood, which makes the event more enjoyable. 1860 Saloon, Game Room & Hardshell Cafe is unique in that there are three rooms in one building, all sharing the same kitchen and menu. The Saloon features an old-world backbar and plenty of cold beer. There is live music every night and weekend afternoons. The Game Room, also with a bar and high top tables, is a great gathering spot for playing darts, shuffle board, foosball and more. It’s also available for for reserving private events Monday through Thursday and weekend afternoons. The Hardshell Café has a New Orleans courtyard atmosphere to enjoy a meal or meet for a drink before or after the Blues game. Two giant jesters and the 500 gallon fish tank enhance the experience.